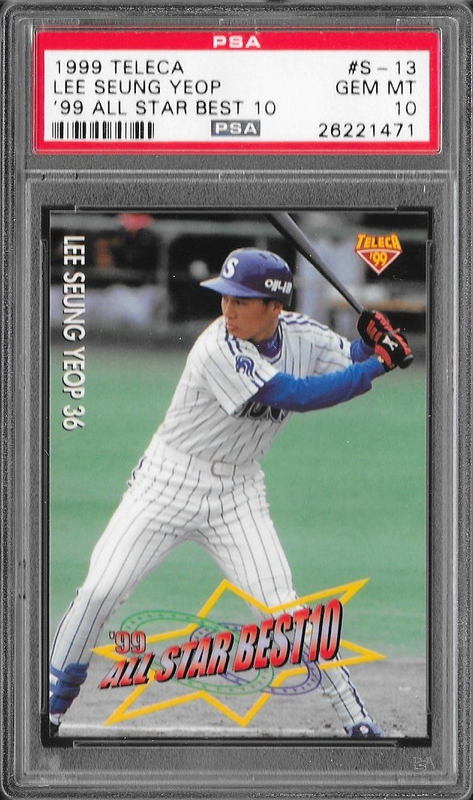 A few months ago I submitted several raw Lee Seung-yeop cards to be graded by PSA. Thankfully they came back as 10's and a single 9. These cards were Japanese BBM, a couple US and four Teleca. 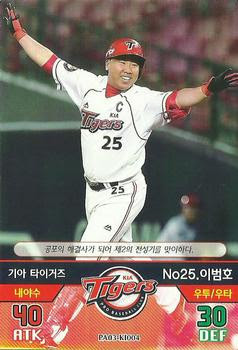 Now, I have many more Lee cards to submit but this time they will be recent Korean cards (2014-2016). 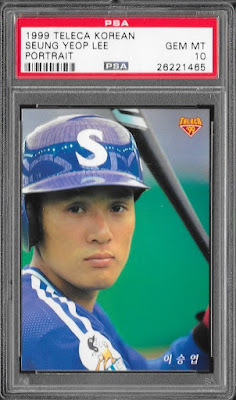 The Teleca Korean (as PSA calls them) has already graded a few but nothing recent. This is where I will break down the companies that produced cards of the last 15 years or so. When I asked PSA what they want me to know name these when I submit them, they directed me to the sets listed on tradingcarddb.com, which I uploaded. So, being a PSA collector and knowing they always try to use the company name on cards (i.e. 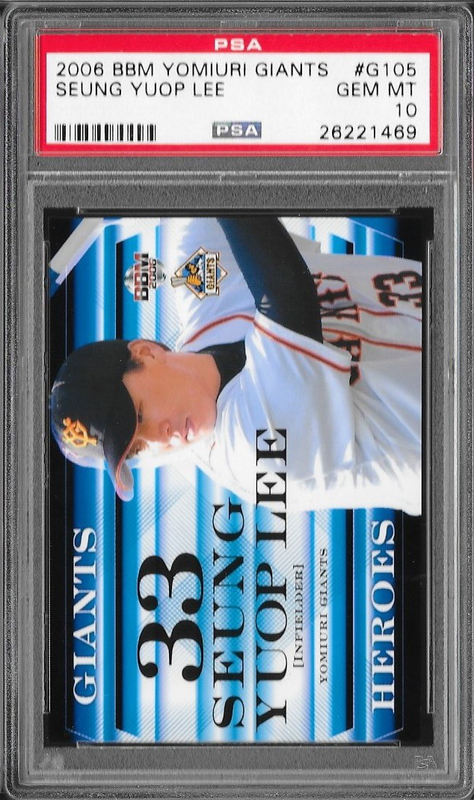 Topps, Donruss, Fleer, etc..) I am in the process of renaming these since I uploaded all these on tradingcarddb without company names. I will also be asking Jason Presley to rename them on tradingcarddb since I don't have the permissions to do so yet. 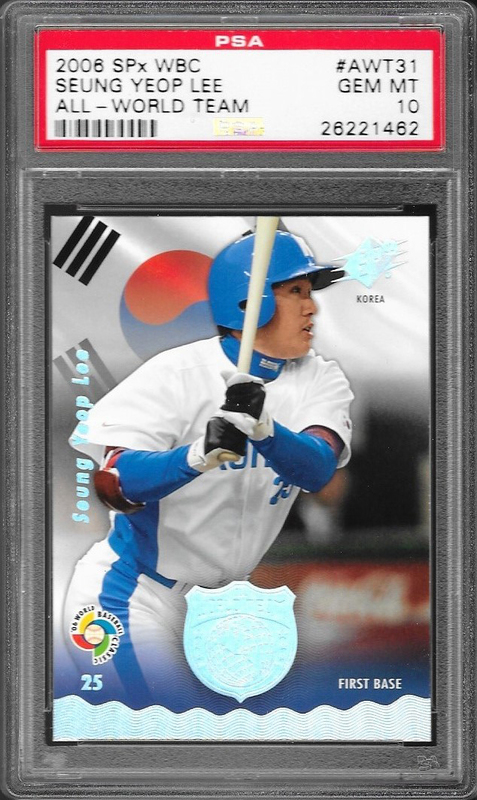 I plan to submit at least one card from each of my Korean sets so that they are listed in the PSA POP report and Korean cards can have more exposure and be listed in other places. 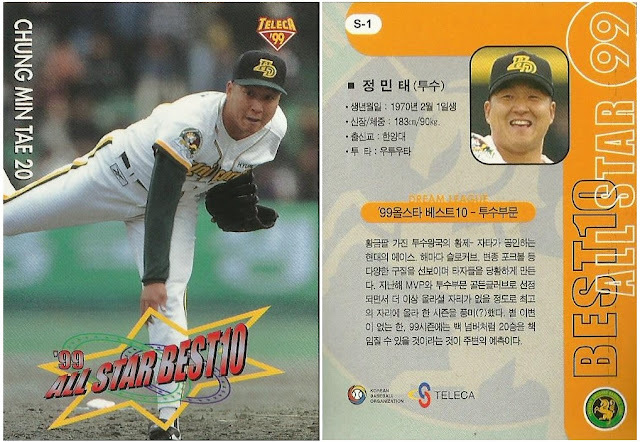 At the moment, I'm not finding any Japanese BBM or Japanese/Korean Teleca on the report, though I saw a 1999 Teleca Lee Seung Yeop months ago. Teleca produced various sets in 1999 and 2000. A few of the 2000 sets were a review of events during the '99 season. 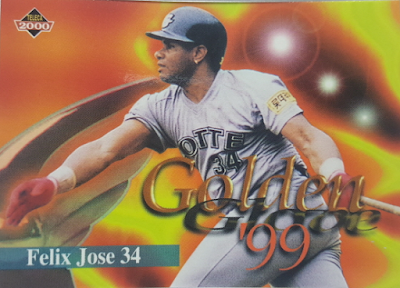 These included the Korea '99 Japan set and the '99 Golden Glove set. 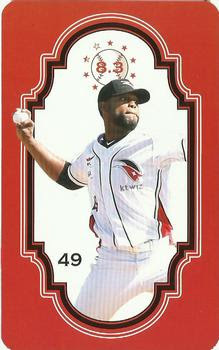 The latter set has 10 cards and includes two foreign players, Felix Jose and Dan Rohrmeier. 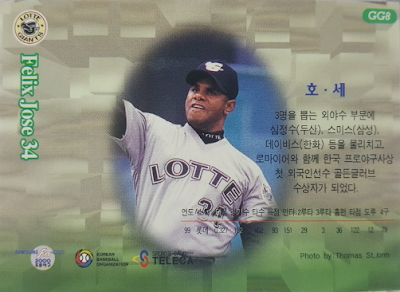 The foreign Korean card pioneer Thomas St. John is credited for the Felix Jose photo on card #GG8. 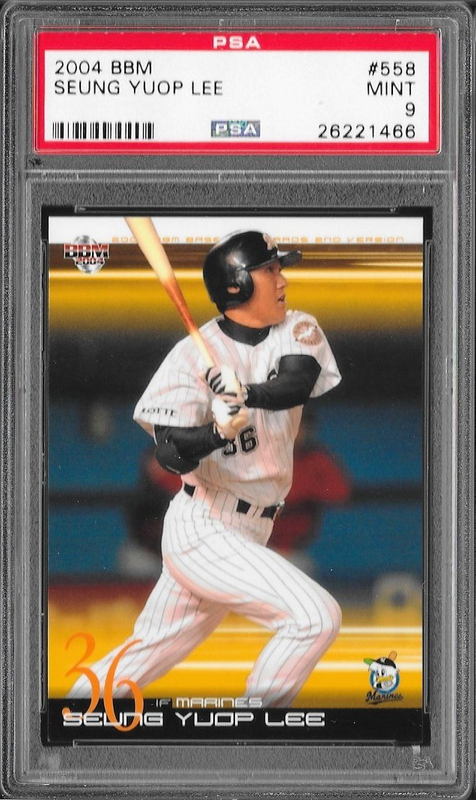 Like many other Korean sets, I've rarely found them complete and have had to buy cards as singles. At the moment I only have two cards of this set. 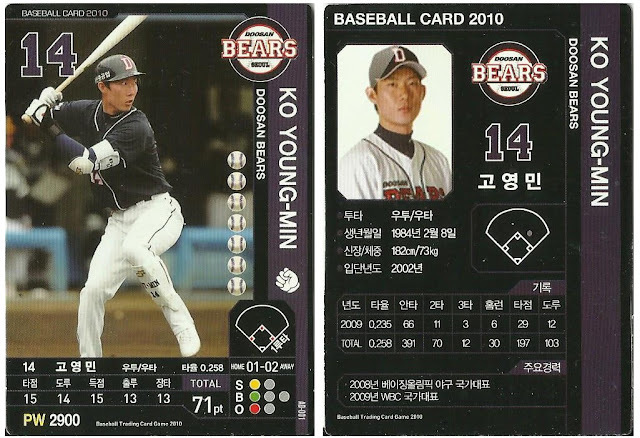 This set, along with many other Korean sets, can be found HERE at the Trading Card Database. 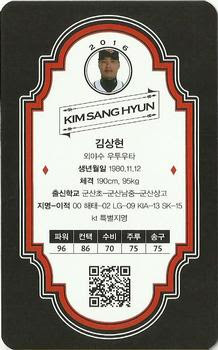 In 2016, the KT Wiz (Suwon, Korea) released a fanbook with lots of information all about the team which included five random cards. 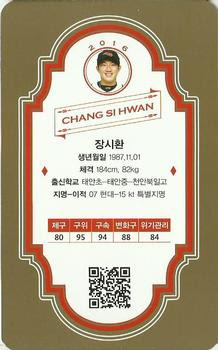 The fanbook costs W15,000 (~$12.50) and can be bought in the team store or their website (잡화 tab). 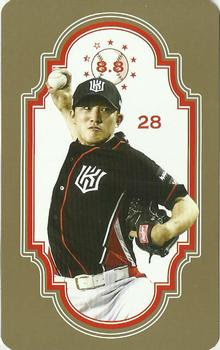 The entire set is 25 cards, which includes four foreigners. The cards come in five colors: red, black, gold, silver and magic and are packaged in a ziplock bag slightly bigger than the cards. Each player only has one card and one color. These cards are also taller and more narrow than your average card. These card numbers were taken from their uniform numbers. 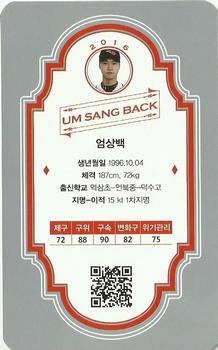 NOTE: #12 Sang-Back Um, later changed his jersey number to #12 from #56. So if you do try to collect the full set of 25 cards, which I may because the two books I bought had no duplicates (10), it will cost you at minimum $75, if you hit no duplicates. If you are able to find others who have duplicates than you may save some money. I have uploaded the set HERE and a video at the bottom of this page. Here are some of the cards from the set. 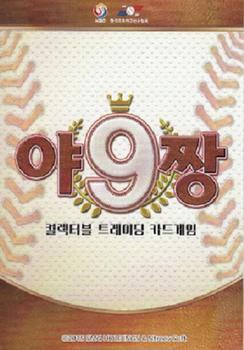 2016 brought us a second set issued by SMG Holdings/Ntreev Soft entitled "Forever Ace," 야9짱 영원한. 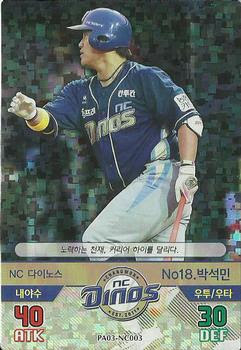 This set is pretty much a photocopy of the first set issued in 2016, "Diamond Winners" 야9짱 금강불괴. The Forever Ace set has 140 cards in all. 100 base cards, 10 per team, and 40 inserts, 4 per team. 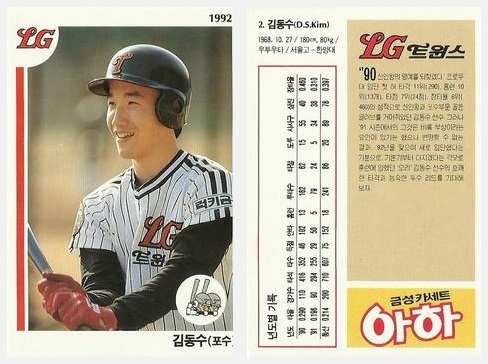 This time around some players were either removed from the set or the number of their card changed, allowing for different players to be in the set and on the parallels. The parallels are the same format. The player in the 001 slot takes the Gold Signature and Clear card parallels, the 002 slot takes the Gold Kira and finally the 003 slot takes the Kira. Once again, the back remains the same. The Clear Card, like PA02, is not translucent. If I had the money to produce these sets, I can't say I'd have the logo back. 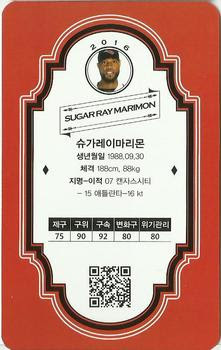 But as we know, these cards are used in a game so perhaps the back having information wouldn't be useful. I uploaded the complete base set HERE. 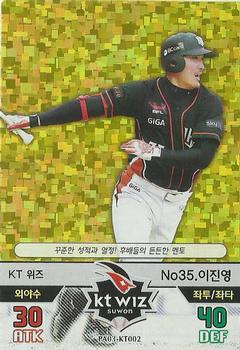 These are some KBO cachets that were released on Oct 7, 2016. I was not able to find any in the post office in Gyeongsan/Hayang. Not sure exactly where they were released. Hoping to find more. 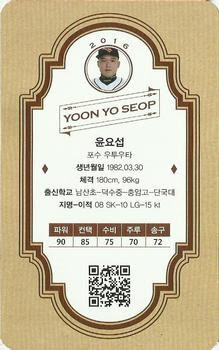 I submitted these Lee Seung-yeop raw cards back in August to PSA when I was visitng my family in the States. I submitted these along with other Don Mattingly and Mark Buehrle cards. I think I got a grader on a good day. I couldn't believe all but one of the Lee's came back as GEM MINT 10. These are from a promo set but what I didn't realize was that two of the three are unnumbered and the third is numbered #80, which might be a mistake (don't have the cards on-hand). I got a lot accomplished last week by uploading images for 4-5 sets. 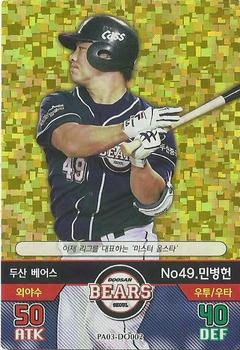 I just noticed I haven't uploaded the 2016 Doosan Bears team set and I never finished uploading the Samsung set. I'll try to do those by the end of this weekend. 2010 is complete. Checklist and images added. 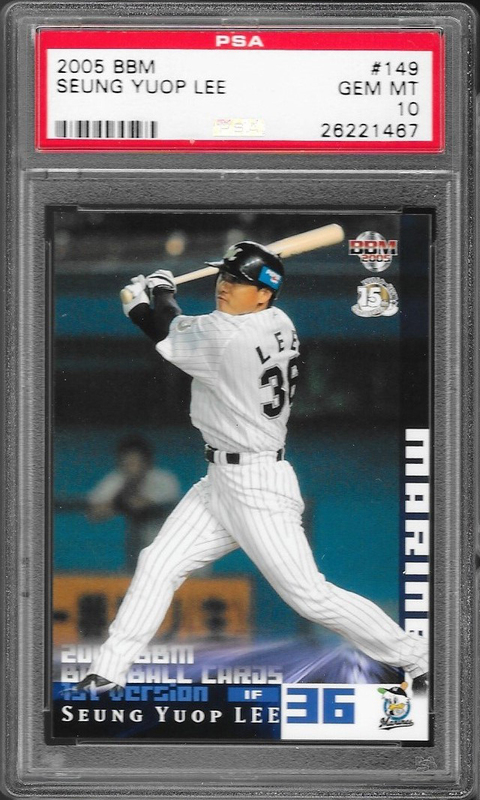 1999 set, I forgot to scan the Lee Seong-yeop card before I sent it to PSA for grading. Ill add that later. Checklist and all other cards added. 1992 LG, I added the checklist and trivia. I will add the card images this week. 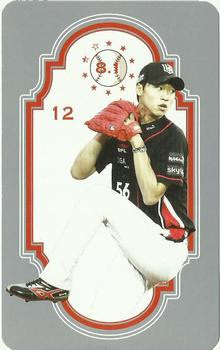 2015 KBO Super Star Season 2, I uploaded SS, AS and BS cards I was missing. 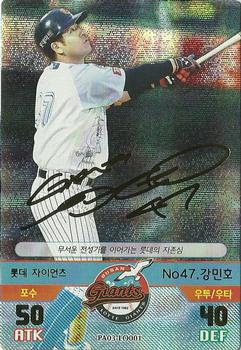 2015 KBO Super Star Season 2 All Star Waves. Added the checklist and uploaded the two cards I have. 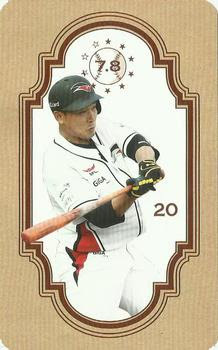 2015 KBO Super Star Stickers, completed the missing names in the checklist. Will crop and add remaining cards this week. Started adding some last night (Samsung, Nexen). I will get busy tying to make checklists for 1999 Teleca and 1999 Teleca Premium. 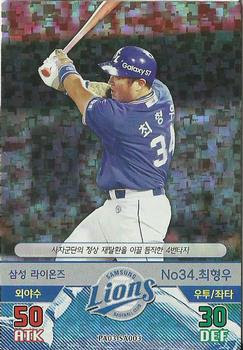 I went to the Samsung Lions game last. They beat KT 11-7 after pulling ahead u-0 in the 1st. I believe they started using special 599 and 600 Home Run balls for Lee Seung-yeop. 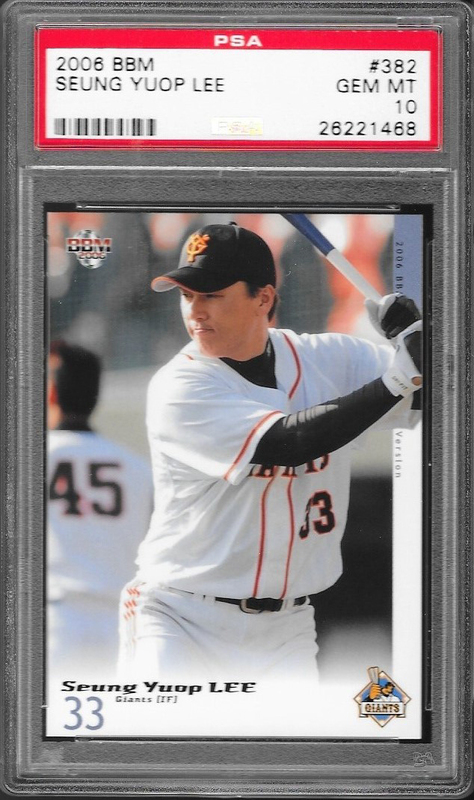 On the day he ended up going 1-3 with a single and walk. 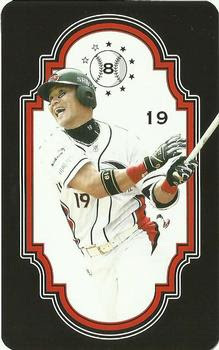 He currently stands at 598HR and 1,998 hits. 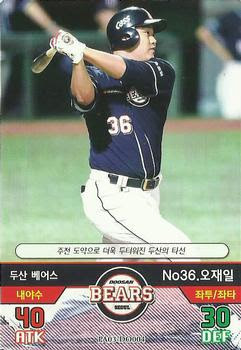 I added a Lee Seung-yeop page as I will start a PSA registry set for him since he's my favorite Korean player. And having more players to collect helps gets rid of possible boredom only collecting one player. It will be located at the bottom of the menu. Because they are "chase cards," Super Auto, Super Piece and Super Stick are under their own sets. 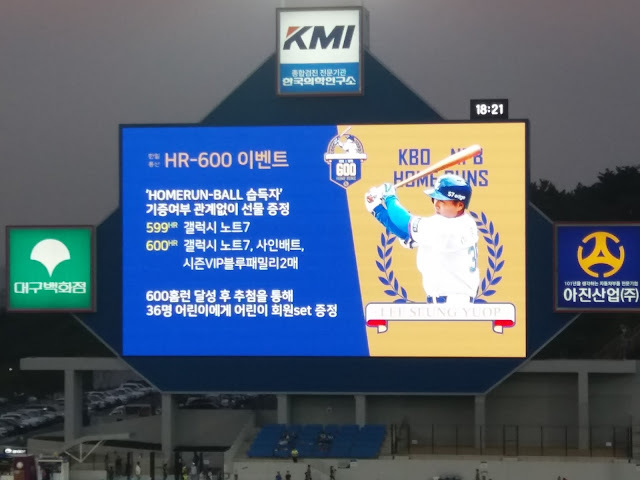 At the moment they are only showing under 2015 sets but should be searchable with "kbo" soon. 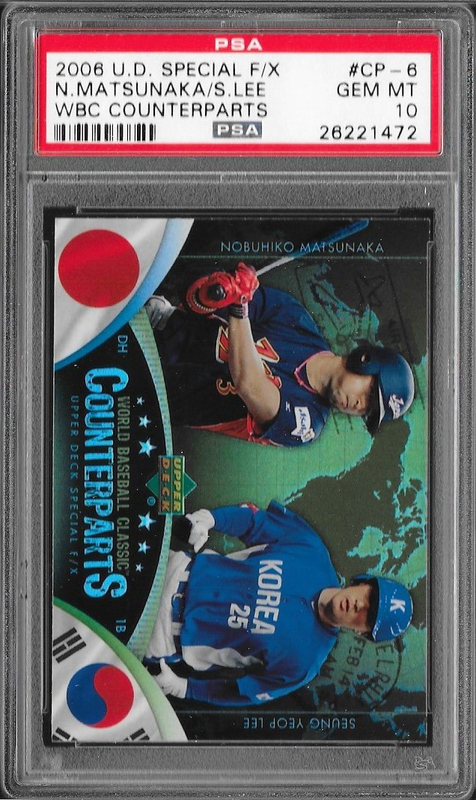 I added two 2015 Season 1 box breaks to the box breaks page. Happy to get 15 cards I needed, including 2 SS and 2 AS sparkle. I finally uploaded the cards I have for this set. I had lost track of what I had uploaded to the site but when I saw the list was empty, I decided to upload them last night. N (Normal), RN (Rookie Normal), BS (Big Star) and AS (All-Star). I just uploaded a Gold Edition box break from a month ago. 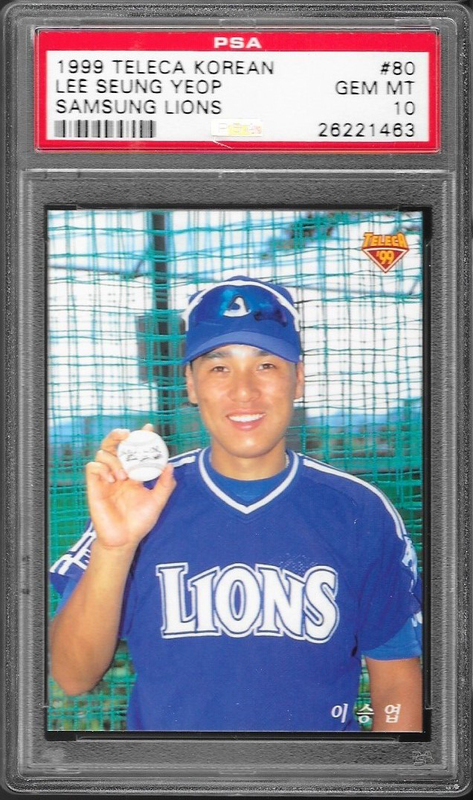 Please take a look at the Sets page as I updated it with the 2015-16 KBO Super Star Samsung Lions Team Set as well as the video box break on the Box Breaks page. This Samsung box has Normal (N), All Star (AS), Big Star (BS), Super Star (SS), Super Piece (SP) and Super Auto (SA). It appears a mini poster (or 4?) is included in the box. For W24,000 I certainly hope it's a complete team set of each type of card, except serial'd cards which Im guessing will need to be acquired with additional boxes. Since Samsung is my adopted Korean team, I will purchase a box and post the results, hopefully within two weeks. I am working on uploading more content to this site as well as getting some cards together to sub to PSA this month. 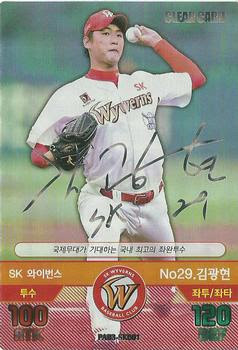 I have several cards of Jung-Ho Kang, Byung-Ho Park, Suk-Min Park, and Koo-Ja Wook, plus the gold coin card of Seung-Yeop Lee. 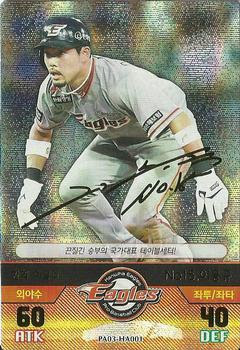 Assuming PSA doesn't have an issue with my translation of the set names, I will be ecstatic to have Korean cards graded.